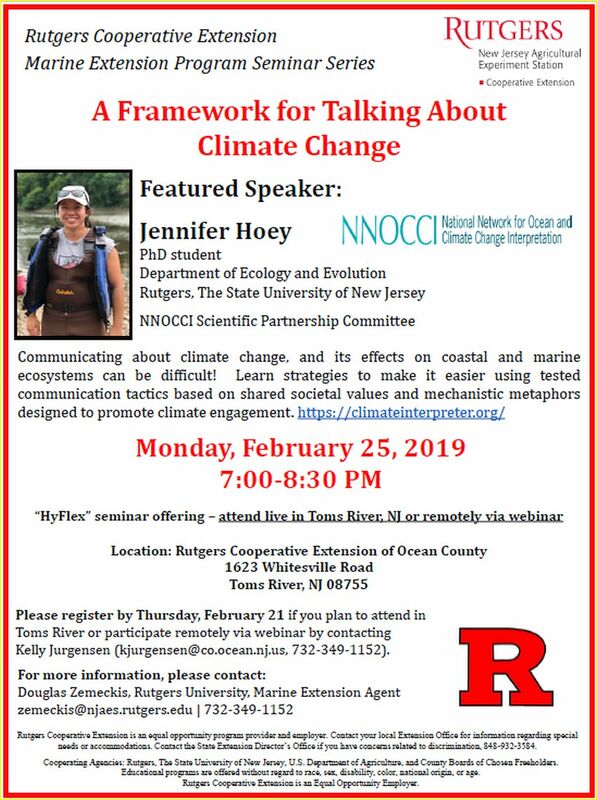 The next seminar as a part of our Marine Extension Program Seminar Series (MEPSS) with Rutgers Cooperative Extension will be on Monday, February 25 from 7:00-8:30 PM. "A Framework for Talking About Climate Change"
Communicating about climate change, and its effects on coastal and marine ecosystems can be difficult! Learn strategies to make it easier using tested communication tactics based on shared societal values and mechanistic metaphors designed to promote climate engagement. Check out the homepage of Climate Interpreter ( https://climateinterpreter.org/ ) and the National Network for Ocean and Climate Change Interpretation ( https://climateinterpreter.org/about/projects/NNOCCI ). This will be a free "HyFlex" seminar where people can attend live at the Rutgers Cooperative Extension of Ocean County (1623 Whitesville Road, Toms River, NJ 08755) or remotely via webinar. Please feel free to forward this announcement and attached flyer to anyone who might be interested and to contact me if you have any questions.